528 pp. $59.95 (paper), ISBN 978-1-55753-579-5. Jews not only are interested in Jesus of Nazareth, but are also writing about him--no bookshelf on the subject today would be complete without volumes by the late Geza Vermes, Paula Fredriksen, Daniel Boyarin, and others, as well as a copy of the Jewish Annotated New Testament (I admit to some special pleading here, but not much). Also popular today are volumes in which Jews and Christians together engage the question of Jesus's Judaism (for example, Philip A. Cunningham, Joseph Sievers, Mary Boys, and Hans Hermann Hendrix's edited collection Christ Jesus and the Jewish People Today: New Explorations of Theological Interrelationships  and Bruce Chilton, Anthony Le Donne, and Jacob Neusner's edited collection Soundings in the Religion of Jesus: Perspectives and Methods in Jewish and Christian Scholarship ). These studies all go beyond the subjects of history and theology; they all necessarily address, whether by intent or use, the difficult questions of how Jews and Christians, after the Shoah, relate to each other. The Jewish Jesus, a collection of nineteen essays stemming from a May 2009 Case Western Reserve University symposium, "Jesus in the Context of Judaism and the Challenge to the Church," challenges Jews and Christians, in editor Zev Garber's terms, to speculate on what the claim that the "Christ of Christian belief lived and died a faithful Jew" might mean (p.1). Reinforcing the challenge, each essay includes discussion questions appropriate for the classroom and Jewish-Christian dialogues. Overall, Garber has produced an often instructive, frequently inspirational volume. Chilton ("The Kabbalah of Rabbi Jesus") presents Jesus as an illiterate teacher whose knowledge of scripture was mediated with oral Targumim; this Rabbi Jesus taught his disciples how to achieve merkavah visions (i.e., mystical visions of the divine chariot) comparable to what he received at his baptism. Chilton's deemphasis on Jesus's anti-imperial agenda offers an apt contrast to Garber's "The Jewish Jesus: A Partisan's Imagination," which resurrects the spirits of S. G. F. Brandon and Hyam Maccoby in seeing Jesus as a revolutionary sympathizer whose nationalistic aspirations were replaced by the Gospel's pro-Roman and anti-Jewish apologetic. Not all resurrection accounts are convincing. Joshua Schwartz's "Jesus the 'Material Jew'" details Lower Galilee's "Jewish" markers--mikvaot (ritual baths), stone vessels, Sabbath lamps, aniconic decoration, lack of pig bones, etc.--and thereby challenges the frequent claim that Jesus's Galilee, and so Jesus, was less interested in distinct aspects of Jewish identity. In contrast, Yitzchak Kerem ("The Jewish and Greek Jesus"), following Hyman Enelow's A Jewish View of Jesus (1920), resurrects the romanticized, apologetic, stereotypes of Judaeans as "legalists" in contrast to the "lyrical" aggadic-based Galileans. Again, some views are best remaining in the ground. Ziony Zevit ("Jesus Stories, Jewish Liturgy, and Some Evolving Theologies until ca. 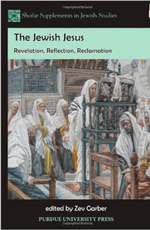 200 CE: Stimuli and Reactions") positivistically proposes that second-century Jews processed stories of Jesus "through a list of predications available to them in the liturgy," including the Birkhot Hashachar and the Shemoneh Esreh (p. 74). Rivka Ulmer ("Psalm 22 in Pesiqta Rabbati: The Suffering of the Jewish Messiah and Jesus") compellingly argues that the readings of Psalm 22 in reference to Esther and Messiah Ephraim are reactions to its "Christian application to Jesus" (p. 114). Herb Basser's delightfully anachronistic "Avon Gilyon (Document of Sin, b. Shabb.116a) or Euvanggeleon (Good News)" reads Jesus as a baal shem (master of the Divine name), Jewish wonder worker, faith healer, eschatological preacher, and halakhic rigorist. Yet Basser finds the Christian canon "rooted in the hatred of Jewish beliefs and practices ... painted over with a thick layer of nonkosher fat" (pp. 103, 104). In his true-to-form "What Was at Stake in Parting of the Ways between Judaism and Christianity?" Richard L. Rubenstein focuses on the Aqedah; drawing on, among others, the Apostle Paul and Sigmund Freud, Rubinstein concludes that even mystically oriented Judaism rejected union with the divine whereas Christians obtain this union with Eucharistic practice. I do wonder how his claim that the Christ allows "the brothers to become one with him rather than the Father, thereby freeing them from the temptation to commit ... deicide against the Father, a crime they can freely ascribe to the Jews, who have repressed the memory of the primal crime" will play in Jewish-Christian dialogue groups (p. 155). Sara Mandell's "The Historical Jesus as Jewish Prophet: Its Meaning for the Modern Jewish-Christian Dialogue" concludes, "if we wish to understand why Jesus the Jew was a prophet for his time, we must see him as the Suffering Servant of the Lord" (p. 302, emphasis in original). The claim, albeit overstated, nevertheless provides a plausible rubric by which Jesus was understood, and may have understood himself. In his eloquent "Before Whom Do We Stand?" Henry F. Knight asks in light of the Shoah "whether or not Christianity requires a Jewish other" (p. 328). James F. Moore's unfortunately titled "The Amazing Mr. Jesus" is a "post-Shoah midrash" with imaginative intertextual readings (e.g., Matthew 14.13-20 and Numbers 20). Shaul Magid ("The New Jewish Reclamation of Jesus in Late Twentieth-Century America: Re-Aligning and Re-Thinking Jesus the Jew") shows that Jewish reclamations of Jesus are by no means a twenty-first-century phenomenon; how much Jewish readers will appreciate the recovery of, for example, Byron Sherman's giving Jesus a positive role in Jewish messianic understanding remains an open question. Complementing this attention on present-day dialogue are Emily Leah Silverman's "Edith Stein's Jewish Husband Jesus" and Steve L. Jacobs's concern for such categories as soteriology and Christology in "Can We Talk? The Jewish Jesus in Dialogue between Jews and Christians." Studies of the premodern Jesus have farther to go in terms of reclamation. Steven Bowman ("Jewish Responses to Byzantine Polemics 9th-11th Centuries") would have a stronger case if he explained how he finds "allusions to the Immaculate Conception" in Josippon (p. 187). Norman Simms ("A Meditation on Possible Images of Jewish Jesus in the Pre-Modern Period") finds the protagonist of Sir Gawain and the Green Knight to represent "an obscured and distorted perspective" of crypto-Jews in England. His conclusion, "Jesus is not and never was real in the historical sense" and so he has "nothing to do with Judaism," does not quite conform to the volume's spirit of reconciliation (p. 226). Fortunately, Eugene Fisher's excellent "Typical Jewish Misunderstandings of Christ, Christianity, and Jewish-Christian Relations over the Centuries" follows immediately. Fisher corrects apologetic comments by Martin Buber, Trude Weiss-Rosmarin, Eliezer Berkovitz, and present-day Israeli textbooks. Equally informative is Christina M. Smerick's "Taking Thomas to Temple: Introducing Evangelicals to the Jewish Jesus." Fisher and Smerick show how theoretical concerns and historical data relate to practical application and so directly respond to the book's thematic challenge. Michael Cook ("How Credible Is Jewish Scholarship on Jesus?") insists that "when we Jews by-pass Christian scholarship and plunge directly into Gospel studies, we can appear to commit trespass" (p. 252). The contributors may be forgiven for the occasional trespasses even as attentive readers will be in their debt.